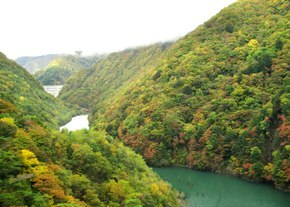 After a long, mountainous (photo) and autumn coloured (photo) bus ride we arrived to Hakone (photo), which is part of the Fuji-Hakone-Izu National Park (photo). We visited the Owakudani valley (photo), which had scenic views over the mountains (photo)(Mount Fuji was in the clouds unfortunately). Ōwakudani ("Great Boiling Valley") is a volcanic area around a crater created during the last eruption of Mount Hakone some 3000 years ago. 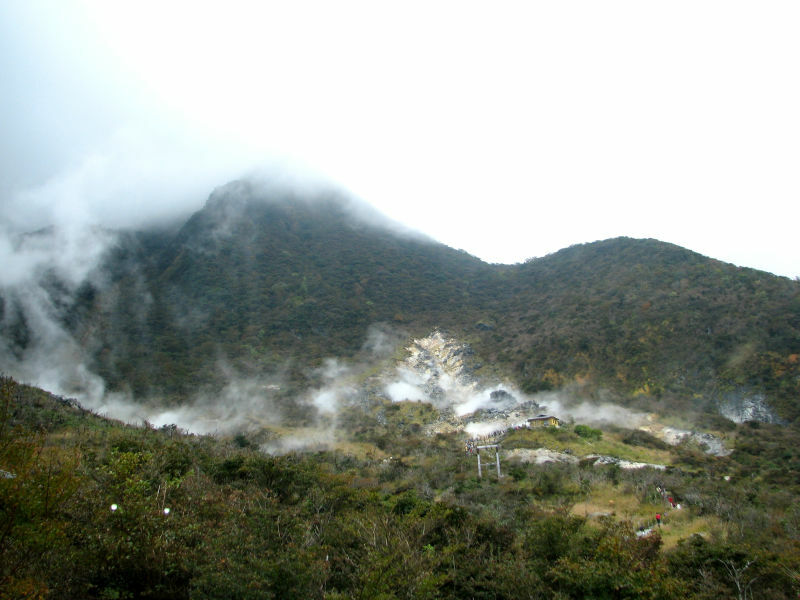 Today, much of the area is an active volcanic zone where sulfurous fumes (photo), hot springs and hot rivers can be experienced (photo). And there's a local specialty: Kuro-tamago - eggs hard-boiled in the hot springs. The boiled eggs turn black and smell slightly sulphuric and eating one is said to add seven years to your life. 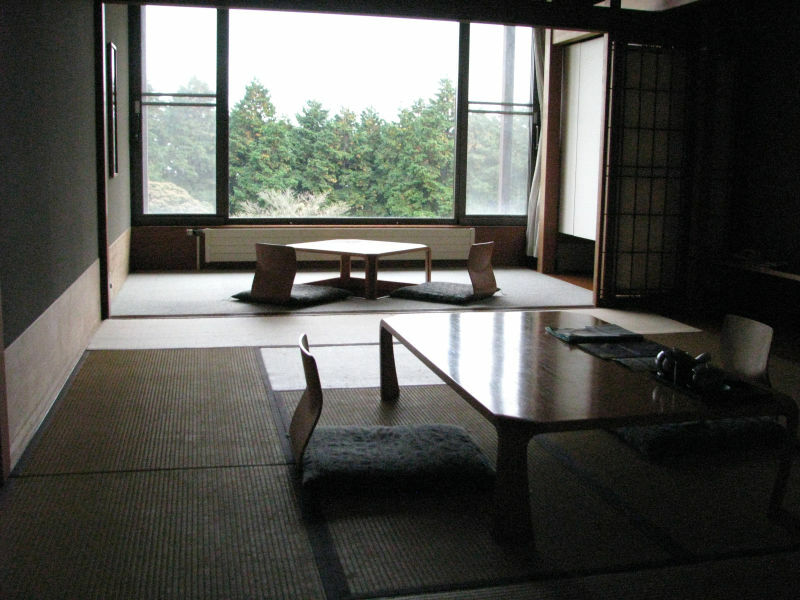 For the night we settled in to the local ryokan (photo, wonderful place!) 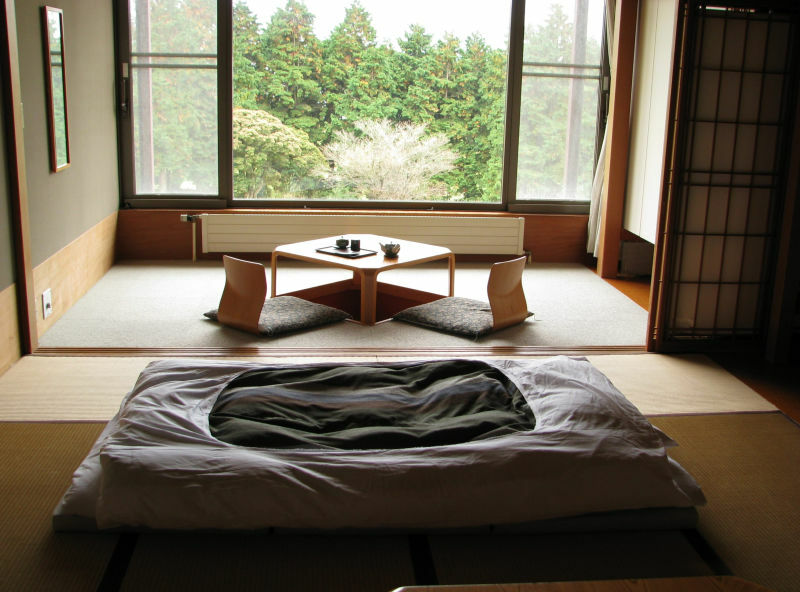 that had tatami mats on the floor (photo), a yukata (light kimono) to wear (photo), a futon spread out on the tatami to sleep (photo), supplies for making tea, and an outdoor onsen (a hot spring bathing place), which was so great for tired feet and a weary body! And it is said onsen have various medical effects as well. After a short course of origami ("paper folding", we were teached by the young and many talented co-tourist boy), we had an exquisite evening meal of Japanese traditions (photo) and then onsen (men and women separately) late to the evening... This was one of the highlights of my trip, definitely!! I love onsen! 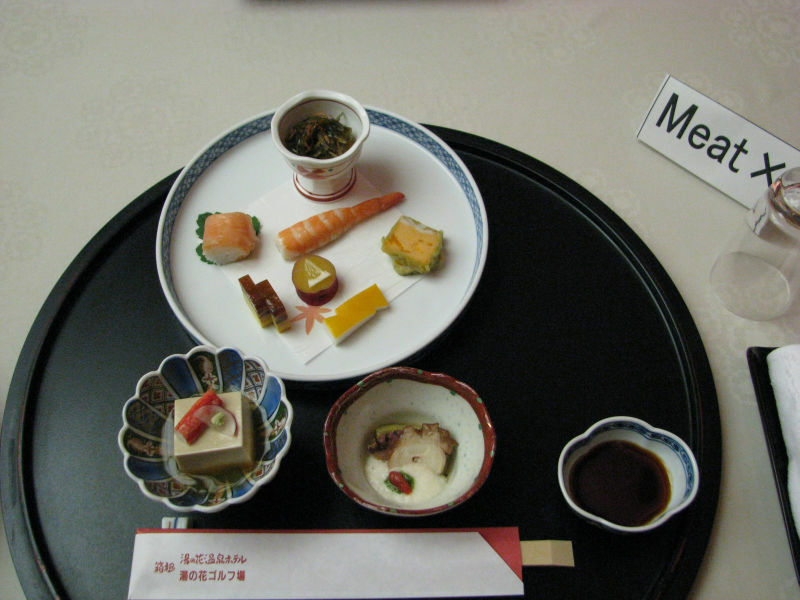 In the morning we had traditional Japanese breakfast, which consisted of steamed rice, miso soup, and various side dishes like broiled/grilled fish, tamagoyaki (rolled omelet), tsukemono pickles, nori (dried seaweed), natto, a vegetables/tofu dish and so on. 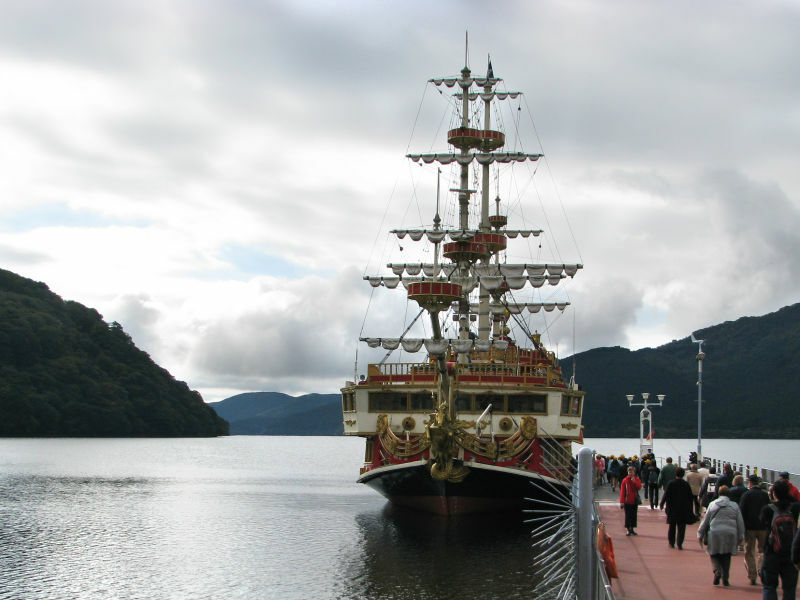 Then we headed to the lake Ashi (Ashinoko, photo) and took a cruise over the lake on a pirate ship (photo). After an enjoyable boatride we took a walk on the old Cedar Avenue path (photo, trees are more than 350 years old) on the other side of the lake. 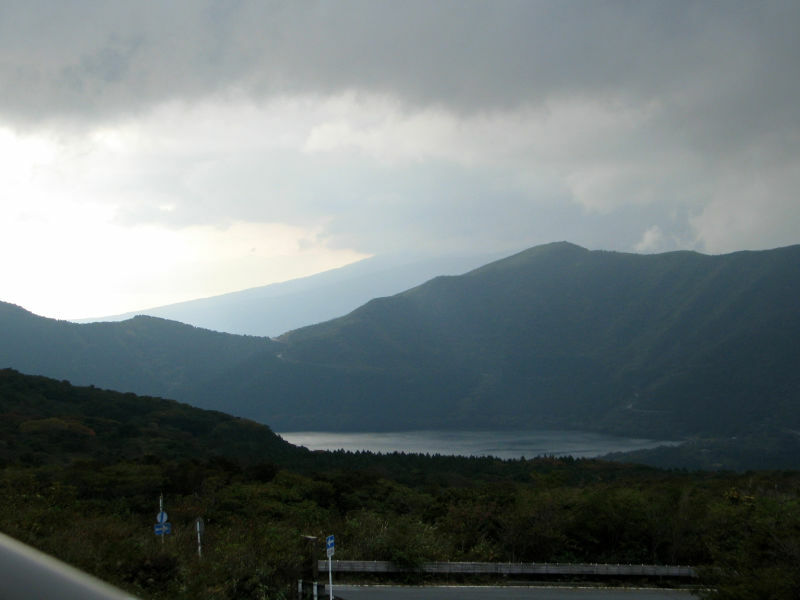 Hakone is part of the volcanically active Fuji-Hakone-Izu National Park, less than 100 kilometers from Tokyo. 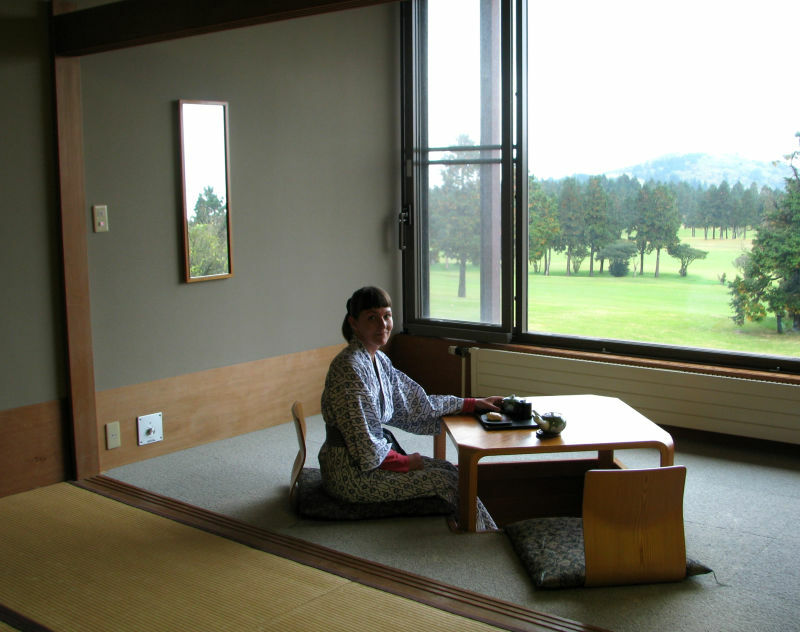 Famous for onsen (hot springs), natural beauty and the view of nearby Mt. Fuji, Hakone is one of the most popular destinations among Japanese and international tourists. In Edo period, Hakone-juku was a post station on the Tōkaidō highway connecting Edo with Kyoto. 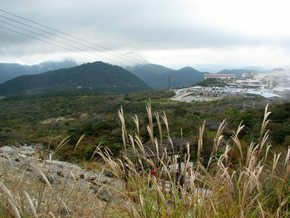 It was also the site of a major barrier and official checkpoint on the route known as the Hakone Checkpoint, which formed the border of the Kantō region. Today you can visit the reconstructed Hakone Checkpoint with all the original buildings and a small museum nearby. 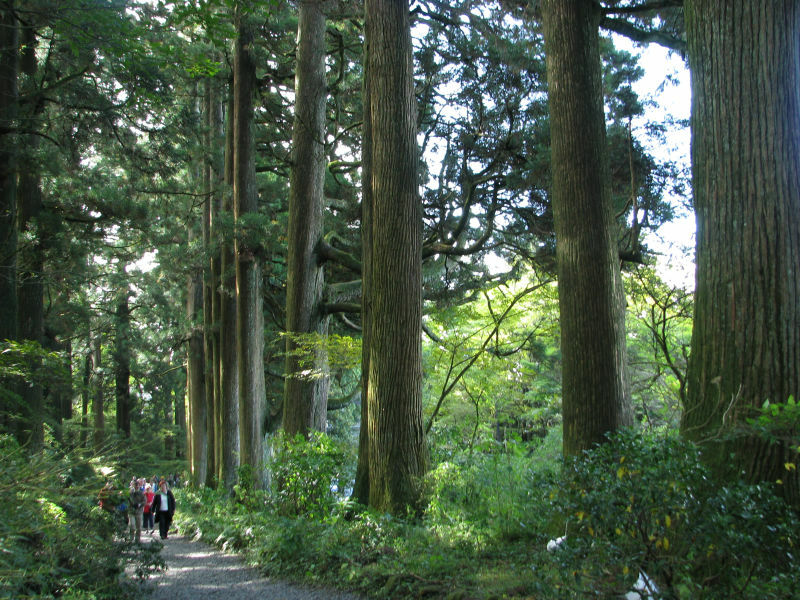 Ancient Cedar Avenue (The Hakone Suginamiki) is a path alongside Lake Ashi featuring over 400 cedar trees of more than 350 years old (planted at the Edo Period). Fuji-Hakone-Izu National Park, centered around Lake Ashinoko, is a popular tourist attraction well known for its onsen (hot springs) and its views of Mount Fuji. Onsen, Hakone has been one of Japan's most popular hot spring resorts for centuries. 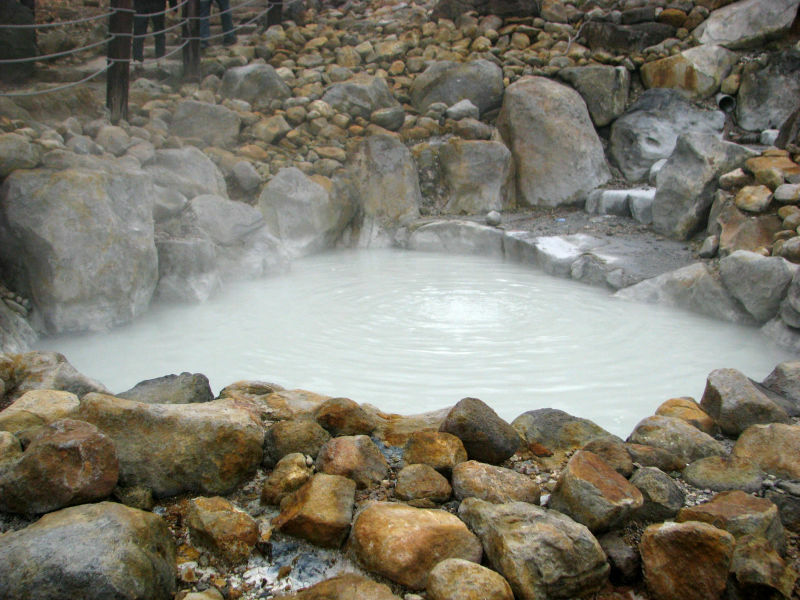 Nowadays, more than a dozen springs provide hot spring water to the many bath houses and ryokan in the Hakone region. 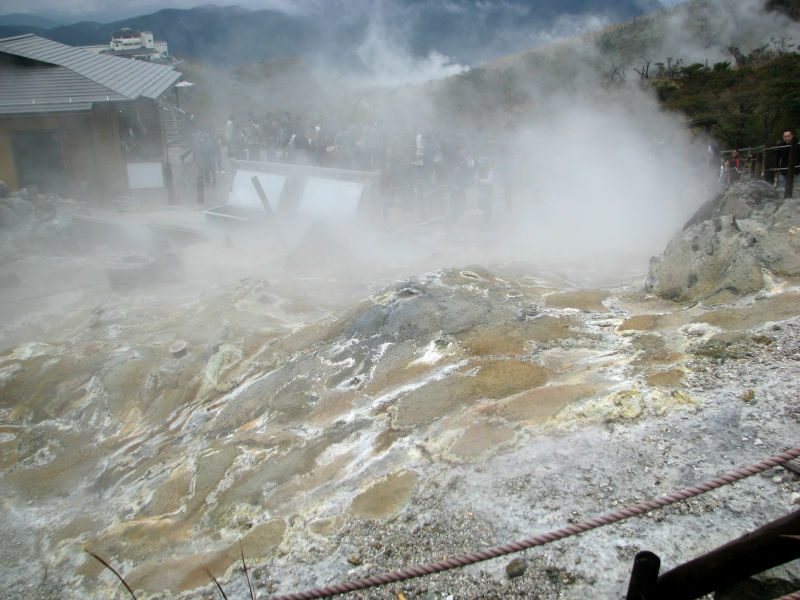 The Great Boiling Valley (Ōwakudani) is a volcanic hot spot full of sulphurous springs. 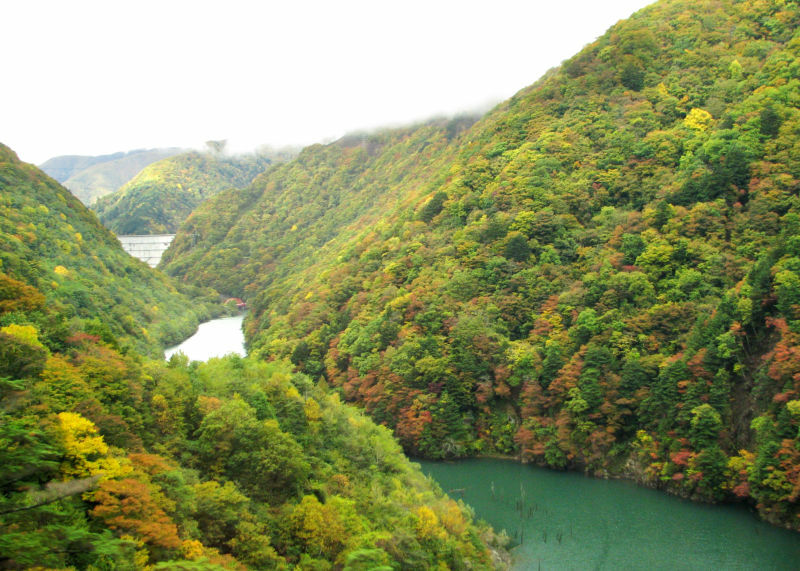 Owakudani can be reached by cablecar from Sounzan and the lake. Hakone Shrine, nestled on the south shore of the lake is Hakone Shrine, built in 757 , used to be worshipped by many generals. Inside the treasure storage are the portrait of Priest Mangan which is dedicated as an Importand Cultural Property, pictures, old books and art objects. 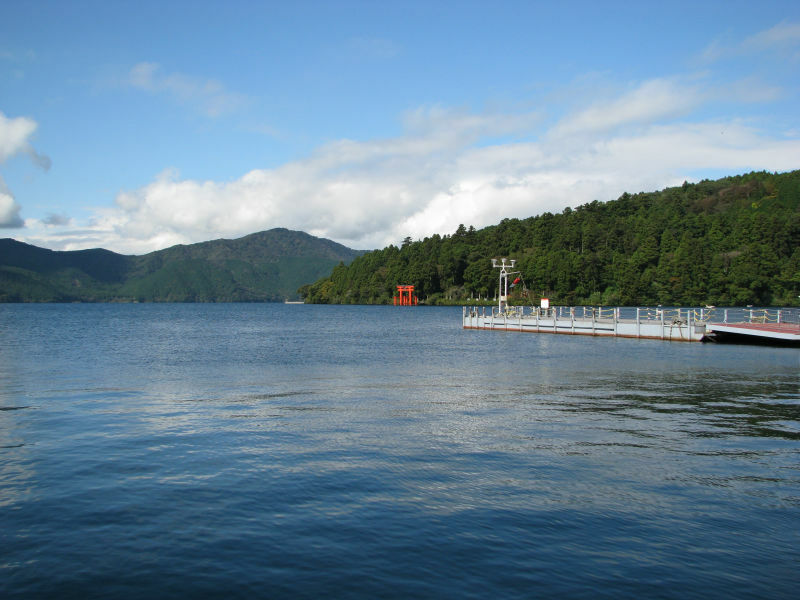 Lake Ashi (Ashinoko) offers beautiful views of Mount Fuji but only on a clear day. You can take a cruise over the lake on the "pirate ships". Hakone Botanical Garden of Wetlands. This botanical garden is the first of its kind and keeps representative plants growing in marsh in Japan. In the botanical garden visitors can see 200 kinds of marshy plants which grow in marshy regions with 1300 kinds of alpine plants, and other overseas plants, 1700 kinds all together . Sengokuhara. Lava from the crator of Mt. 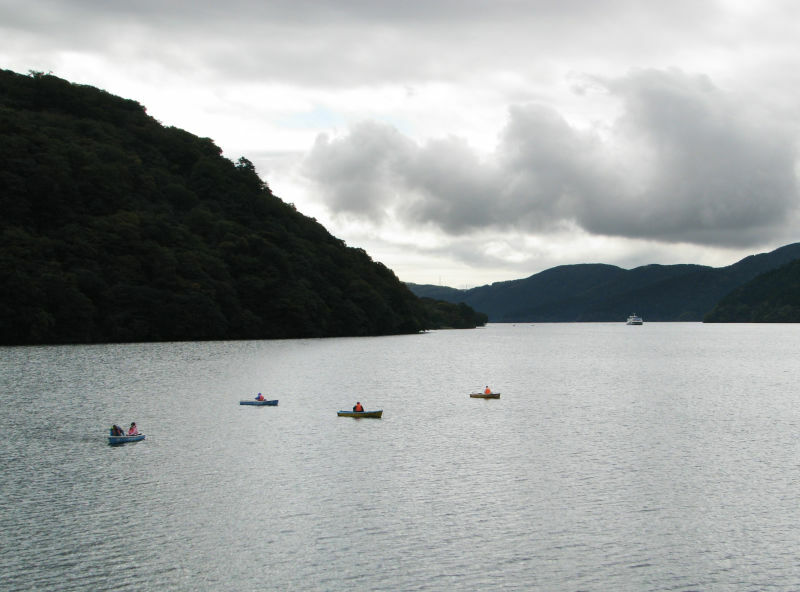 Kami divided Lake Ashi into two, the south half staying as Lake Ashi and the other half becoming a marshy region. 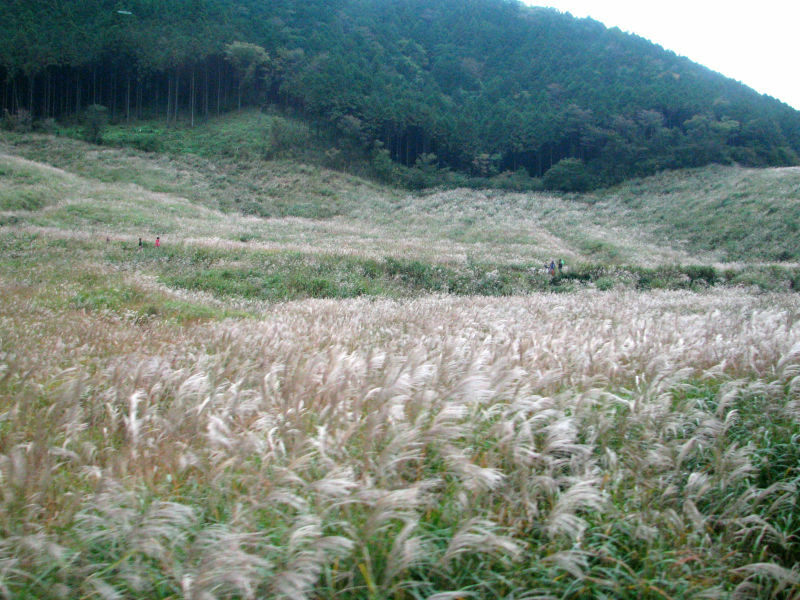 Such rare marshy plants as nohanashobu and mizugoke form communities there, and a part of the region was designated as natural monument in 1934. Hakone Check Point Exhibition. For the purpose of preventing feudal lords from rebeling this check point was placed in 1619. Guns were not allowed to be brought in and women were not allowed to get out of Edo.In 1869, the Check Point was abolished and demolished. 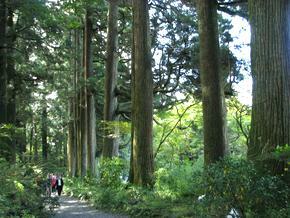 Since then, the ruin has been a noted place in Hakone, designated as an Important cultural Property in 1922. 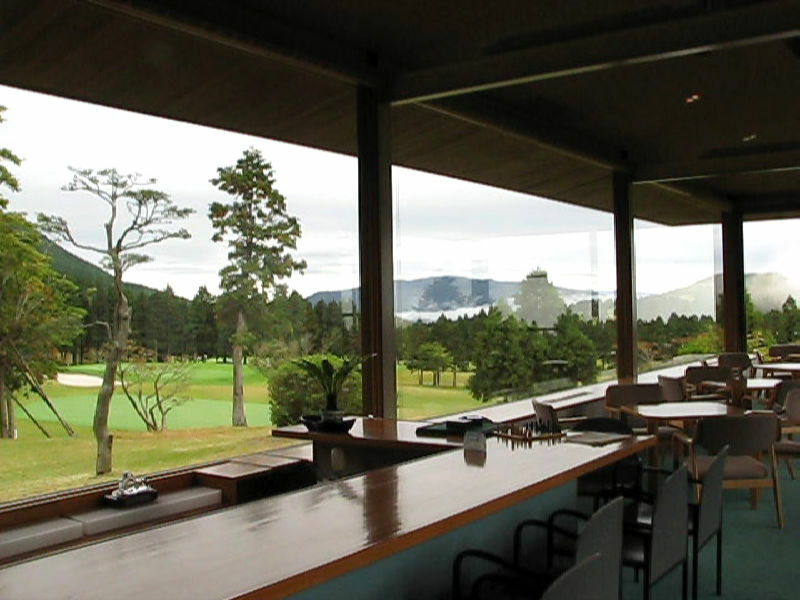 Hakone has a number of art museums, including the Hakone Open-Air Museum, Pola Museum of Art and Narukawa Art Museum. 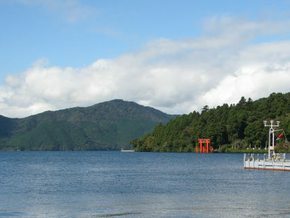 Lake Ashinoko and the torii gate of the Hakone Jinja Shrine (Mount Fuji in the clouds). 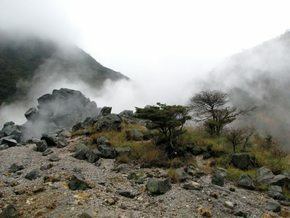 A view from the Owakudani valley. 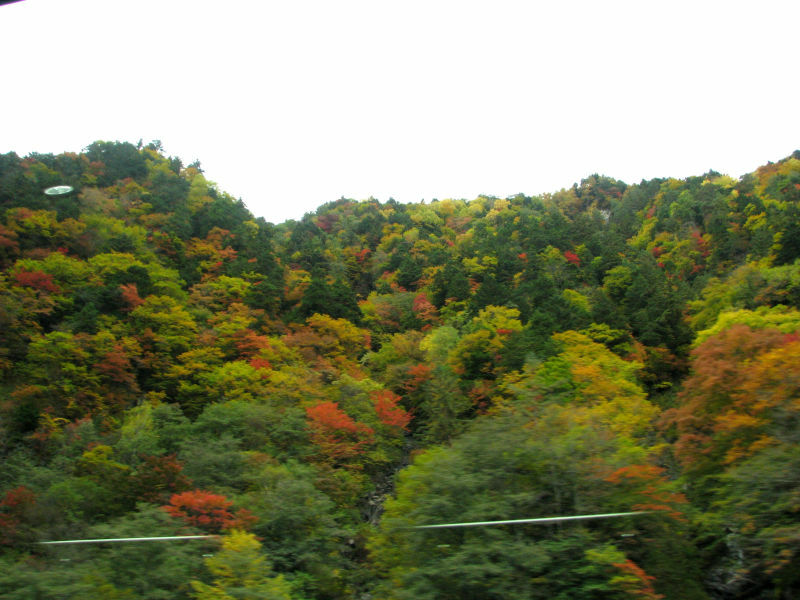 Mountains in their autumn colors.